Do you think the new hard drive can be used for good and it can offer you trouble-free storage for the next ten years? If so, then think again. The very fact about hard drive is that the larger the capacity hard drive obtains, the more chances you will need hard drive file recovery. Capacity disk capacity and heavy task of reading and writing large amount of data create stress on components of hard drive, no matter whether you hard drive is 120GB or 4TB. Hard drive also can come in forms of portable USB drives, laptop, RAID, etc. We can definitely say that hard dive will fail or stop working some day in the future, and that is why we need hard drive file recovery software. Another issue of computer hard drive is that, as technology progresses, larger capacity are needed to store more files, which sets high requirements for hard drive manufactures. Hard drive have to improve the way it store files and enlarge capacity, also it has to make its size and shape smaller. Therefore, we can’t see apparent changes looking from appearance of a 4TB hard drive and 120GB hard drive. The result can be that operating temperatures and density of file storing grows, which mean potential damage and file loss of hard drive. Then hard drive file recovery will be needed. Have you ever experienced file loss issues or system booting problem? When you place hard drive close to your ear, can you hear weird buzzing noises coming from hard drive? Are all of your partitions on the hard drive in healthy state? Has one of them become RAW or inaccessible partition? What is your first action when you realized files get lost from hard drive? Are you used to delete files permanently with Shift + Delete? Did your computer encounter the “blue screen”? If yes, what’s the error message? Does computer slows down as long as the hard drive is connected? You have your answer now, and you must have idea of whether you need hard drive recovery software. When you notice any abnormal phenomena you should be on alert that hard drive data may get lost. Hard drive file recovery can be done by Eassos Recovery provided that hard drive doesn’t have severe physical problem. And here are an example of recovering lost files from hard drive. Step 1: Launch Eassos Recovery after free downloading and installing. Step 2: Select recovery mode for the actual file loss case. Step 3: Select hard drive in question and click “Next” button to scan lost files. 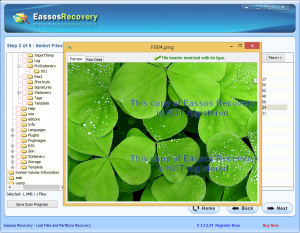 This entry was posted in Data Recovery and tagged hard drive file recovery, Hard drive file recovery software, hard drive recovery software by EASSOS. Bookmark the permalink.